CULTURES ARE $50 PER PLATE. RECEIVE 50% OFF WHEN ORDERING 4 PLATES OR MORE. ALL PURCHASES ARE GROWN OUT IN STERILE LAB CONDITIONS AND MADE TO ORDER. We have done extensive research with this strain over the past 7 years. Specific traits are as follows; cold tolerant, fast growing, meaty and very tasty. We prefer to fruit this variety between 3 to 18 Celsius, and have noticed a unique striping characteristic when grown in colder climates. This strain can handle freezing temperatures, making it an excellent oyster variety to start off the season in the spring! We rely on this particular oyster mushroom throughout the hot summer months in our area. In the Okanagan, we typically get a few weeks exceeding 35 Celsius which stresses most strains. Elm Oysters are commonly grown by small-scale, artisan mushroom farmers who supply local markets. Assumed to be a sub species of Pleurotus ostreatus, however origins unknown. This strain develops 3 to 5 gigantic fruit bodies per cluster, which is uncharacteristic to most commercial varieties. This strain takes 8 weeks to mature from initiation to harvest. We prefer to antler our Reishi by top fruiting and using the sleeve of the mushroom bag to concentrate CO2. 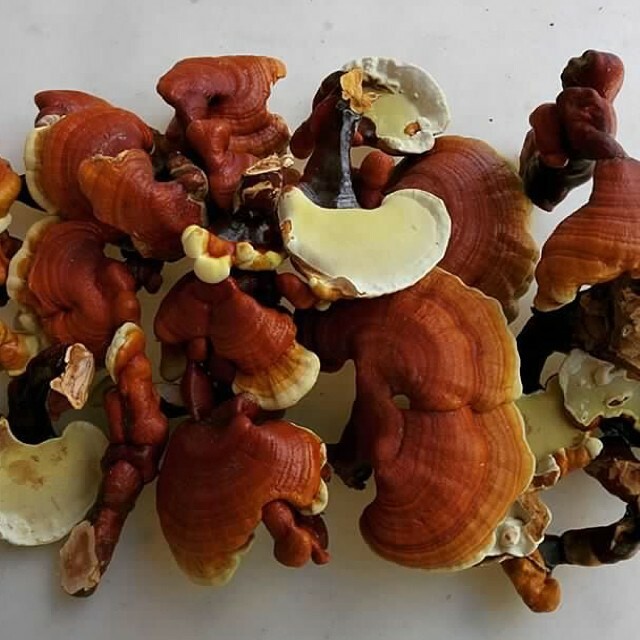 As the reishi grows closer to fresh oxygen it will “conk out” as seen is the photo above. Great in teas or with a morning cup of coffee. This is a strain that was found locally and it is able to handle a wide range of temperatures; making it great to grow in transition from cold to hot temperatures and vise versa. Refer to WTF’s strain list or Check Out This Video Below for more information.